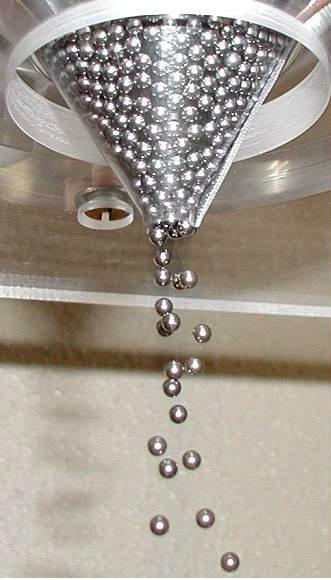 This assembly for dispensing a granular material includes a spillway intended to receive the granular material with a lower section thereof being fitted with a lower outlet through which the material is intended to flow by gravity. The assembly further includes a partial sealing head which is engaged in the lower section and defines therewith a space wherein the granular material is intended to flow by forming a lap around the head. Application, for example, in the fields of food-processing, civil engineering, mechanics, plastics, pharmacy etc.